DE PERE, Wis. (CNS) — There’s only one place in northeast Wisconsin where families can purchase a Christmas tree and get Tootsie Rolls in the bargain. It’s the Christmas tree lot run by the Knights of Columbus’ Abbot Pennings Council 3955 in De Pere. If the free Tootsie Roll isn’t enough incentive, knowing that your purchase goes to benefit charitable projects may sweeten the tree-buying decision. Handing out Tootsie Rolls is nothing new for members of the Catholic fraternal service organization. Knights Tootsie Roll Drives, held to benefit people with intellectual disabilities, began in Wisconsin in 1973. In 2018, the program raised $726,736 statewide, according to the Wisconsin State Council. On the other hand, selling Christmas trees for charity is not a common Knights’ fundraiser. Only a handful of Wisconsin Knights councils operate Christmas tree lots, and the De Pere council likely has the longest running operation. This year the council is celebrating five decades of selling trees. According to Mueller, who has been involved in the Abbot Pennings Christmas tree fundraiser since the early 1980s, the project began in 1968, when council members drove to a tree farm, cut the trees and brought them back to De Pere. The first Christmas tree sale netted $375. The council sold about $11,000 worth of trees the first weekend of operation this year, he said. Today, the trees are purchased from North Countree Christmas of Wausaukee. 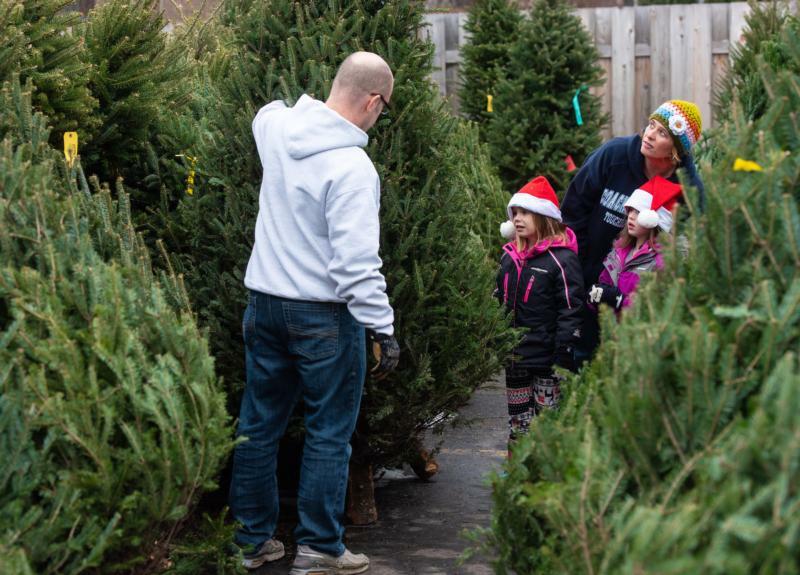 Many of the families who buy their trees from the De Pere Knights are repeat customers, said Mueller. One key to the group’s successful enterprise is its volunteer force. About 150 people — council members and their families — work two-hour shifts all season. The lot is open seven days a week. Many of the Knights even offer customers advice on their Christmas tree purchases. Since the Christmas tree lot opened in 1968, more than $330,000 has been raised for charity, said Mueller. Proceeds from the Christmas tree sale support several ministries in the Green Bay Diocese, including programs and shelters for the homeless, transitional housing, outreach for victims of domestic abuse, a ministry to young families, Eagle Scout programs, the Retirement Fund for Religious collection, local Catholic schools, and seminarians and novices to religious life. Some funds also go to the diocese’s World Mission Services for purchase of rosaries for the missions.